I try not to stock up my pantry with snack items-mostly deep fried items like chips,bhujias etc.Whenever we have the urge to eat it,we make sure we buy very small quantities so that it finishes as soon as our craving is satisfied.It works out fine for us but I am in a fix if someone drops by unexpectedly.I have served salt biscuits and tea with a sheepish grin to friends,but then only our closet pals come by unannounced and it is actually not a problem at all. Sometimes I take a peep into my kitchen and open endless dabbas[boxes/containers] hoping to find some unfinished packet of snack or chips and am always disappointed.Like last time--it was raining heavily outside and I really wanted to have my cup of chai with a plate of piping hot bajji or bonda.No such luck.I had what my amma calls "sukhi chai" or dry tea,though I don't understand how tea can be dry! !She means chai without any accompaniments!! Ajay has this habit of having roasted papads as a snack while watching tv.I find roasted Lijjat papad too hot for my taste buds.But there was nothing else on offer so I decided to pep it up a little by making this instant papad snack--Masala Pappad.Ready in under 5 minutes and reminiscent of street side chats,this one's a winner totally!! Cut the pappad into 4 wedges [ you could serve the pappad whole too,but this way the pappad does not turn soggy once you add the masala]. Roast on a low flame on a gas stove till browned well or else you could microwave them too. 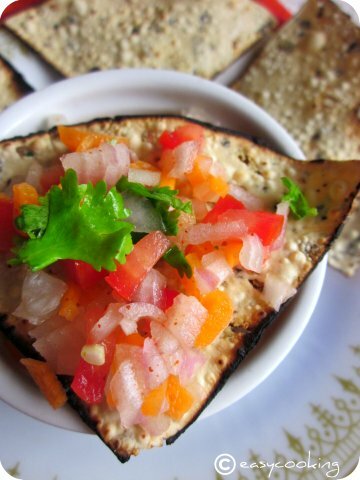 Arrange the papads and the masala on a serving tray and serve. 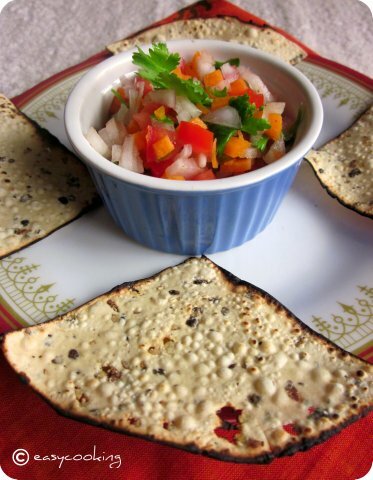 You could either put the masala on the papad and serve or use the masala as a dip,which would keep the papad crispy till the last bite!! 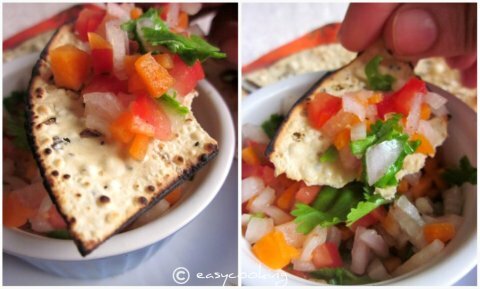 Am an addict to this masala pappad, clicks makes me drool..
loooks yummy divs...such vibrant colours too! very well clicked! My Fav Chat!!!! Pass the plate Plsss!!!! looks very yummy.wonderful clicks too.